Western blot analysis of whole cell lysates from A431 (A) and K562 (K) cells probed with Rabbit anti RIP-2 (AHP1590). 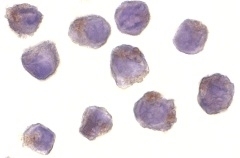 Immunocytochemical staining of A431 cells with Rabbit anti RIP-2 (AHP1590). Rabbit anti Human RIP2 antibody recognizes Human Receptor-interacting serine/threonine-protein kinase 2, also known as RIP2, RIPK2, RIP-like-interacting CLARP kinase or CARD-containing interleukin-1 beta-converting enzyme-associated kinase. RIP2 is a 403 amino acid ~60 kDa cytoplasmic protein belonging to the protein kinase superfamily. RIP2 is a kinase that regulates TNF and Fas induced-apoptosis and is involved in the generation of the pro-inflammatory cytokine IL-1beta. Over expression of RIP2 has been shown to induce apoptosis, and the activation of NF-Kappa-B and JNK. RIP2 is widely expressed in a range of human tissues. Antiserum to human RIP2 (NT) was raised by repeated immunisation of rabbits with highly purified antigen. Purified IgG was prepared from whole serum by affinity chromatography. A peptide corresponding to amino acids near the amino terminus of human RIP2. Rabbit anti Human RIP2 detects a band of approximately 60kDa in A431 cell lysates. Inohara N., et al (1998) RICK, a novel protein kinase containing a caspase recruitment domain, interacts with CLARP and regulates CD95-mediated apoptosis. McCarthy J.V., et al (1998) RIP2 is a novel NF-kappaB-activating and cell death-inducing kinase. Thome M., et al (1998) Identification of CARDIAK, a RIP-like kinase that associates with caspase-1.